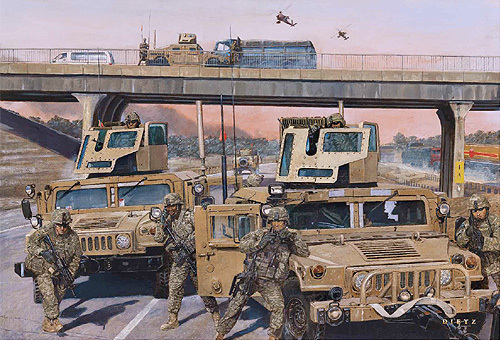 Overall Size: 23.5" x 31"
In June 2007, 3-73 CAV Squadron arrived at Convoy Support Center (CSC) Scania, Iraq. The Squadrons Area of Operation included security of Main Supply Route Tampa, the main artery linking Kuwait to Baghdad and numerous outlying towns. The area also included a maze of irrigation canals and farmland. As soon as 3-73 CAV hit the ground at CSC Scania, the Squadron worked to establish a relationship with the local population, to establish local governance, civil military operations and local security.